Pettifleur Berenger has taken to Instagram to address those recent Real Housewives of Melbourne Season 5 rumors. "Sorry I can neither confirm nor deny the rumours," she wrote about her rumored return to the Foxtel hit reality series. 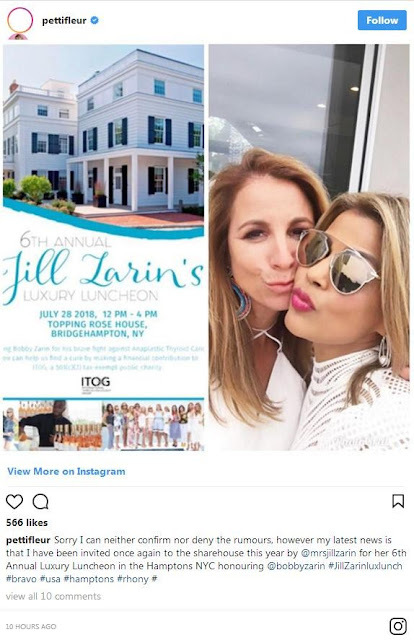 "However my latest news is that I have been invited once again to the sharehouse this year by @mrsjillzarin for her 6th Annual Luxury Luncheon in the Hamptons NYC honouring @bobbyzarin #JillZarinluxlunch #bravo #usa #hamptons #rhony." The news comes after rumors circulated the internet last week after a Reddit page revealed that The Real Housewives of Sydney was allegedly put on hold since Foxtel decided to focus on The Real Housewives of Melbourne, which was rumored to begin production for Season 5 in June. The page also claimed that Pettifleur Berenger was set to return to the show's fifth season and that Janet Roach was allegedly exiting the show after four seasons. However, Jackie Gillies took to Twitter to shut down these rumors. The #ShineShineShine psychic revealed that neither Sydney or Melbourne have been renewed by the network. "Sydney & Melbourne #Housewives have not been commissioned for next season as of yet," she wrote. Meanwhile, Berenger also denied the rumors when she revealed to a fan via a direct message that at the moment she has not been contact to return to RHOMelbourne. "Hi sweetheart, I don't think another season is on the table at the moment. They couldn't cope without me. (Only joking) sending love," she wrote. Meanwhile, LALATE reports that RHOMelbourne is returning to the U.S. this summer, which Season 4 is set to air in July on Bravo as part of the network's summer lineup.